Our newest addition to our 20-1000 MHz family of products is the Model D9317. This 200 W CW, 2-Way Combiner operates with less than 0.7 dB Insertion Loss, and a minimum of 15 dB Isolation. Measuring just 3.75 x 3.75 x 0.9", the D9317 is ideal for combining four 50 Watt modules. Our newest addition to our 20-1000 MHz family of products is the Model D9317. 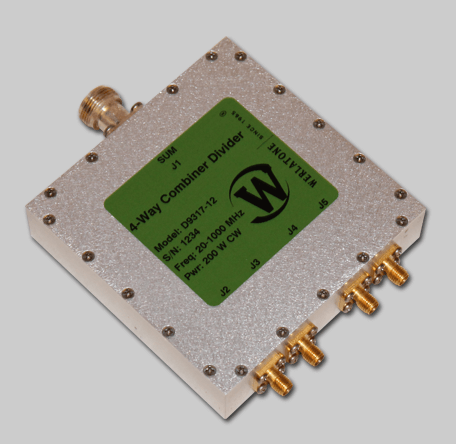 This 200 W CW, 2-Way Combiner operates with less than 0.7 dB Insertion Loss, and a minimum of 15 dB Isolation. Measuring just 3.75 x 3.75 x 0.9″, the D9317 is ideal for combining four 50 Watt modules.